With the new OSHA Regulation change and a greater understanding of the side-effects from silica exposure, the importance of properly certified dust extractor systems is becoming more evident. Many businesses, and workers still aren’t using the appropriate dust extraction equipment in their day to day duties – some by choice, but others are being misled by vague terms that mask the truth and give the illusion that they are something they’re not. Dust extractor systems with Certified HEPA filters ensure sufficient filtration so that you are not being exposed to any contaminants in your workplace. Sadly, we have come across terms that are being promoted in a way that makes them seem efficient and safe. With terms like, “HEPA-Like”, “HEPA-Type” or “HEPA Ready”, there is no guarantee that the filters have been individually tested to ensure adequate filtration. Furthermore, due to the addition of “Like”, “Type” or “Ready” to the name, the manufacturers have slipped through a loophole and are not required to meet the strict certification standards, like genuine HEPA filters are. As a result, customers are getting a false sense of protection and are being exposed to dangerous and toxic particles. Bartell Global is teaming up with Ermator to help bring awareness to the issue so that you can be properly educated and make sure that you are not only investing your hard earned money into equipment that works, but also in exceptional equipment that ensures proper health and safety for the users, and those around them. HEPA stands for High-Efficiency Particulate Air filter (you may also have heard, High-Efficiency Particulate Arresting filter). They are made up of randomly arranged fiberglass fibers varying in size and thickness between 0.5 and 2.0 micrometers (or microns). These fibers have the ability to filter particles as small as one-300th the diameter of a human hair. A true HEPA removes up to a minimum of 99.97% of airborne respirable pollutants. This is important because a lot of the most hazardous particles are so small that they can easily sneak through most filtration systems that aren’t properly certified to ensure the minimum percentage of filtration. Inertial Impaction – This traps the heaviest or largest particles. – Because these particles are heavier than the air and other particles around them they continue in a straight line while the others can weave through some of the initial fibers in the filter. Ultimately these fibers tend to be the first to trapped and held. Interception – Medium sized particles at snatched up via interception. 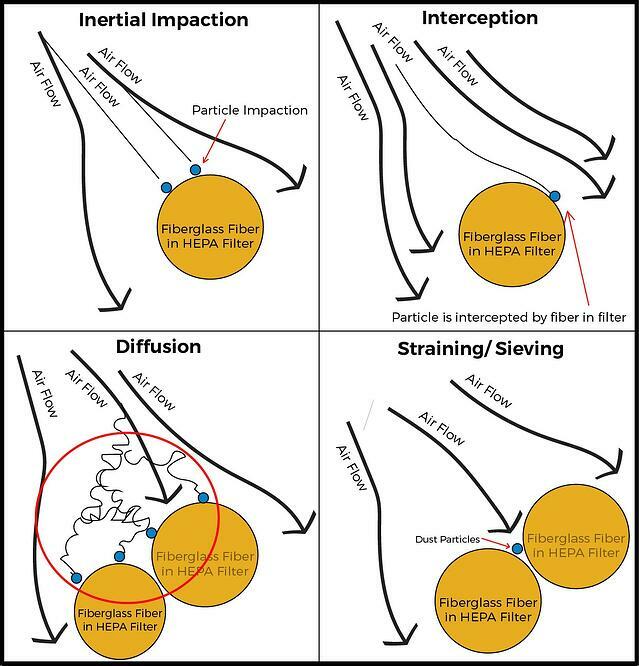 This simply refers to when the fiberglass fibers in the filter intercepts the particles and they become stuck. Diffusion– The randomness of the fibers in the filter cause particles to collide with each other and the fibers and they become trapped. Straining/ Sieving – This is when the particles become trapped between two fibers in the filter. We want to ensure that our customers are getting the safest most efficient products on the market, but also to help bring awareness to the dangers that not having proper dust extractor systems or filtration can result in. By not having adequate filtration you are not protected from toxic silica dust and other dangerous particles. You’ll hear many boast about “HEPA-Ready” equipment and “HEPA-Like” or “HEPA- Type” filters, which is very misleading if you don’t know exactly what those terms mean. HEPA-Type, HEPA-Like, etc. – These are terms that make people believe that the filter is a legitimate HEPA Filter or equally as good as a certified HEPA filter, when in fact it is not. 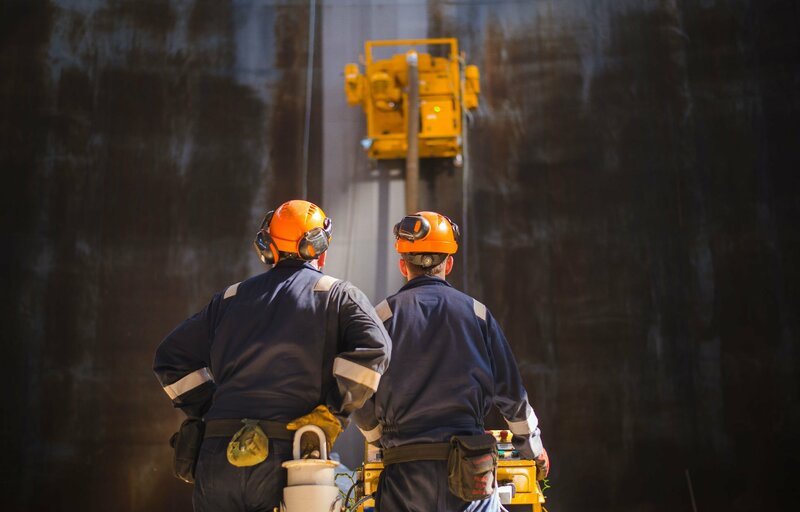 They are not held to the same high testing standards and often don’t comply with the new OSHA regulations; which means they do not protect you from exposure of toxic respirable particles. A legitimate certified HEPA filter should be labeled and signed off, so that you know it has been tested and passed inspection to ensure that it meets the necessary health and safety standards. HEPA-Ready equipment is often marketed as sufficient on its own, but really means that the piece of equipment is compatible with certified HEPA filters. When investing in a HEPA-Ready piece of equipment, be prepared for significant additional costs to properly fit the piece of equipment with a certified HEPA filter. Firstly, the CFM has nothing to do with filtration, it simply refers to the suction power. Second, those higher CFM ratings are based on HEPA-Ready equipment that DOES NOT have a certified HEPA filter. Using a filter that is not HEPA certified, will obviously allow more air through – as well as toxic particles that HEPA certified filters protect you from – allowing for a higher suction rate. The second you add a properly certified HEPA filter, that high CFM rating will drop about 30% because the HEPA filter doesn’t allow as much to pass through. What this means is, not only have you spent money on a “HEPA-Ready” dust extractor system that doesn’t protect you from the toxic particles, but also, that you now have to invest more of your hard earned money into fitting it with a properly certified HEPA Filter – which will cause that unrealistic CFM rating that you paid for, to drop by 30%. Our suggestion is, invest in dust extraction equipment with a built in certified HEPA filter. If you have already purchased a “HEPA-Type, HEPA-Like (etc. )” filter or piece of “HEPA-Ready” equipment, we strongly suggest you to take additional health and safety precautions, by using masks or other pieces of safety equipment to make sure you’re not risking your life and breathing in toxic silica dust and other hazardous particles. If you’re thinking about investing, make sure to check the HEPA filters for the proper labeling and certification. Do your research and educate yourself so that you end up investing in something that doesn’t protect you, your workers, your customers, or even your friends and family from the serious and dangerous effects and life altering consequences of silica exposure and other hazards. We want to make sure that all of you are protected so if you have any questions about this blog or anything related to HEPA Filters, or Bartell Global equipment please feel free to contact us and we would be happy to help.